Our mixed selections of pots have been carefully designed for different habitats, soil types and uses. Many of these mixes have become industry standard and are now specified by Landscape Architects and Garden Designers all over the UK. Take the hard work out of choosing the species you need and let us do it for you. We can supply selections of either 18 or 24 half-litre 9cm square pots. 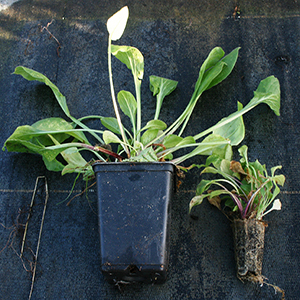 The plants are more established than plugs and mean they will give a bigger impact sooner Pot size next to plug. A selection of half litre pots for a sunny site. A selection of half litre pots for a semi-shade site. A selection of half litre pots for a shaded site. A selection of half litre pots for attracting butterflies. A selection of half litre pots for attracting bumblebees.